Along with quadrotors, and portable game consoles, one of the hacks we never get tired of seeing is an LED matrix table. [Christian Enchelmaier] wrote in to share his take on the ever popular pixelated furniture, which we think came out pretty well (Translation). Instead of going for a full-sized coffee table, [Christian] decided to keep things on the smaller scale his first time out, opting for an ottoman/end table nstead. He constructed a 16×16 matrix using RGB LEDs, encapsulating each one in its own “pixel”, as is common with these builds. [Christian] uses an Atmega 128 to run the show, displaying the current time and date, temperature, music visualizations, games, images, along with short videos. 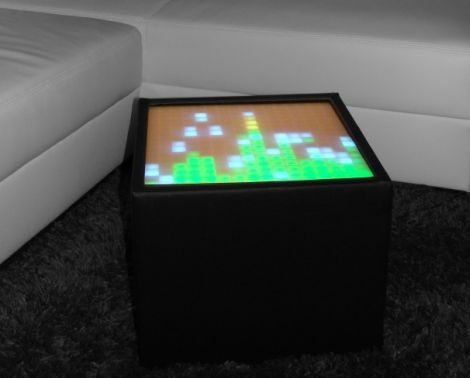 He also outfitted the table with an IR receiver so that he can control the table’s display from afar. As of right now, [Christian] doesn’t have any video of the table in action, but there’s plenty in the way of pictures scattered throughout his build log to keep you busy in the meantime.